The San Jose Blog: South First Fridays Art Walk March 4th! South First Fridays Art Walk March 4th! 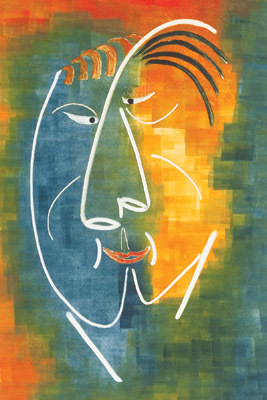 Opening Reception: Folie à Deux: A Delusion Shared By Two an exhibition of monotype prints by Curt Schauerat Caffe Trieste. In his Folie à Deux series (2009-2010), Curt explores the double sided nature of human behavior and psyche and how it can be internalized within a single individual or between two persons and even a society associated with one another. Even between the artist and the viewer. In the monotypes, the characteristic figurative images can be viewed as two individuals or as one with two distinct or shared personalities. The prints are characterized by broken color patterns creating motion, tension and anxiety within and between. In addition to the Folie a Deux prints, he displays similar and related monotypes created leading up to and during the series. Curt is influenced by artists including Picasso, Vigliaturo and Benzoni. He works in monotype, watercolor, glass and mixed media. Artist’s Reception: Phosphene Series: Hand Painted Polaroid Emulsion Lifts by Shannon Amidon at Good Karma Cafe. Phosphene is an entoptic phenomenon characterized by the experience of seeing light without light actually entering the eye. Flashes of light, often caused by rubbing the closed eyes. These images were created by hand painting blank 35mm slides. Polaroid pull-a-part prints were created using a vintage slide printer. 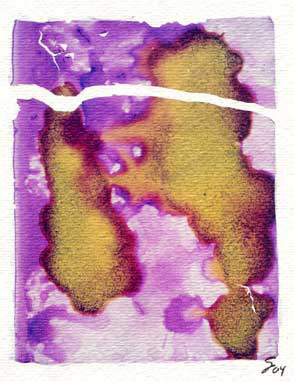 The prints were boiled in water and the emulsion was carefully removed and placed onto watercolor paper. Each emulsion print is hand manipulated and one of a kind. 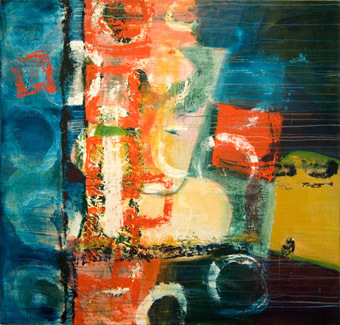 Artist’s Reception: Just In Time, Abstracts by Jane Peterman at Pho69. The series of paintings is a meditation on time and space beginning March 2009 and ongoing. Artists' Receptions for Dotti Cichon & Kathleen Wolf at KALEID Gallery which also features work by 60 other regional artists. Dotti Cichon: The Grandeur of the Commonplace: Impressions of Europe two bodies of photographic work from a recent trip to Europe. 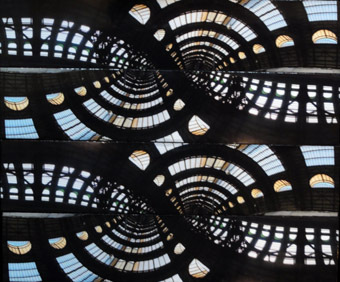 The Grandeur of the Commonplace explores the incredible beauty of ordinary places such as train stations, shopping malls, shops and stairways in panoramic photographs that exaggerate perspective by having forced the camera to do things it was not meant to do. Impressions of Europe, work done in Paris and Les Andelys in France is an homage to the impressionist painters who attempted to capture “impressions” and not just copy reality which is something that, by definition, is a challenge to emulate as a photographer. Kathleen Wolf: Almost Edible This exhibition is comprised of several approaches to food painting: the earliest works represent visual recipes, the second is comprised of viewing food from multiple viewpoints or having it disappear off over the horizon, creating a different type of visual movement. 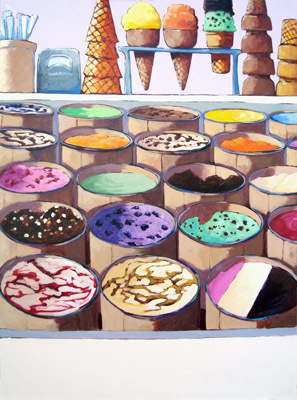 The third, and most recent work invites the viewer to participate in the purchase of food from places they are familar with, an Ice Cream Parlor, Bakery, Deli, etc. Thanks for sharing! Since we're talking about art just to let you know Speedeals is offering 50% off on a 1 hr private dance lesson in Mountain View. You can learn your choice of dance, Ballroom, Salsa, West Coast Swing, or Blues, either as an individual or with your partner! Check out http://speedeals.com/deals/903. Alright speeddeals, you guys are killing me. Please stop posting deals in the comments so I don't have to disable anonymous posting. Thanks.